The Old Testament message was one that man was never able to fulfill. However, Christ in His Sermon on the Mount gave a higher law to the New Testament Church. It is a message of grace and truth that enables mankind to triumph in all things. 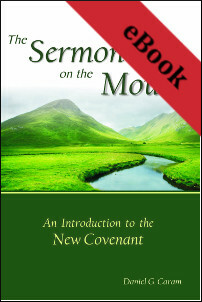 In his commentary on the Sermon on the Mount, Rev. Daniel Caram will give a clear and balanced explanation of Christ’s higher law for the New Testament Church, so that we might be those saints who live a victorious and abundant life in Christ Jesus. Rev. Daniel Caram is a part of the faculty of Zion Ministerial Institute in Waverly, New York. He has also traveled to numerous countries, teaching in Bible schools and seminars and has also authored seven other books, some of which are used in the curriculum of Zion Christian University. Rev. Caram and his wife Jane reside in Erie, Pennsylvania where they have pastored the Church of Mt Zion for over thirty years. Rev. Caram earned his Bachelor in Theology from Vision Christian Bible School and Seminary and his Master of Theological Studies from Zion Christian University.